Chicken jalfrezi is on every single Indian restaurant menu. Now you can make it at home. 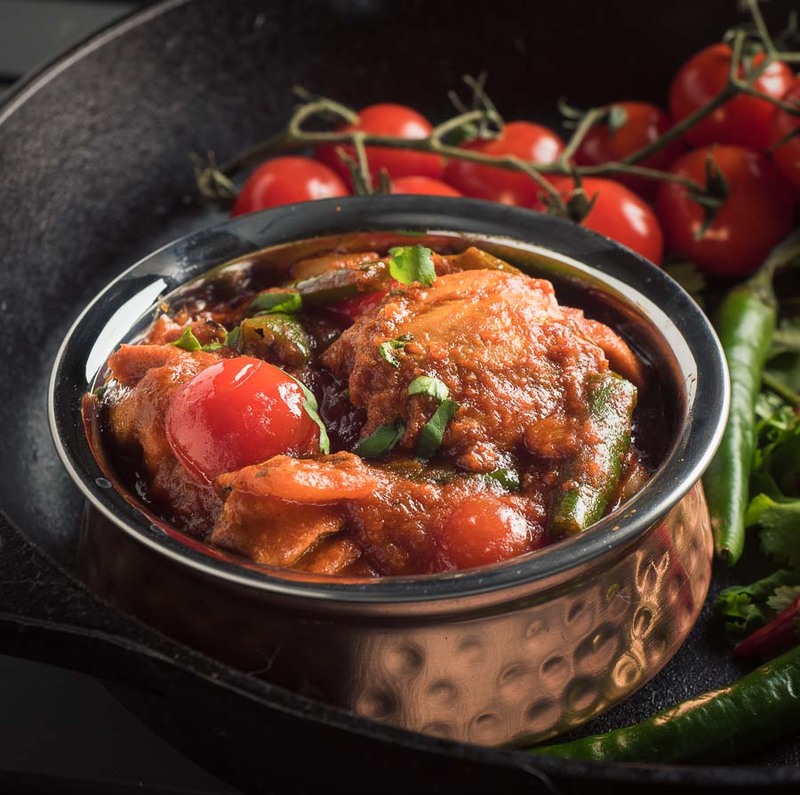 Nearly restaurant chicken jalfrezi is a curry everyone can cook. On a week night even. Maybe not as easy as opening up a jar of curry sauce and chucking in some chicken. But when was the last time that actually tasted like restaurant chicken jalfrezi? Seriously? This is a bit more work. But it’s so very close to full blown Indian restaurant cooking. It should be. It lifts key restaurant tricks. But simplified. And it really works. The key to a good chicken jalfrezi is the green peppers. Took me forever to figure it out. You have to scorch them. Get them to almost blister. Like when you roast chiles. That gives the dish it’s signature flavour. Without that it’s not very good. With that it’s awesome. So simple. But until you know it’s enough to make you crazy. Like anything I guess. Easy when you get it. Infuriating until you do. The other key is onions. With Indian, it’s always the onions. Homestyle Indian curries have you cook onions for a long, long time. It’s pretty much the basis of all Indian curries. You can try to skip this step but the results suffer. Never anywhere as good as it could be. Nearly restaurant style relies on a simple trick to make sure they are cooked. And smooth. Like you get at restaurants. Or like when you open a jar of curry sauce. Just kidding about the jar of curry sauce. Don’t do it. It’s not very good. Want more nearly restaurant style curries? You don't need to dive into full blown Indian restaurant style cooking to whip up a really, really good chicken jalfrezi. 6 boneless skinless chicken thighs cut into 3 pieces per thigh. Remove the onions from the microwave. Be careful. They will be hot. Let them cool slightly. Place the onions, 2 tbsp vegetable oil and 3/4 cup of warm water in a blender and puree until smooth. Set aside. In a small bowl, combine the mix powder, tandoori masala, Kashmiri chili powder, kasoor methi and salt. This is your spice mix. Heat 4 tbsp vegetable oil in a pot over medium heat until it shimmers. Add the green pepper, skin side down. Cook for about 2 minutes. Add the remaining chopped onion and continue to cook until the onion starts to brown on the edges and the green pepper scorches a bit. You really want the colour on the green pepper skin. 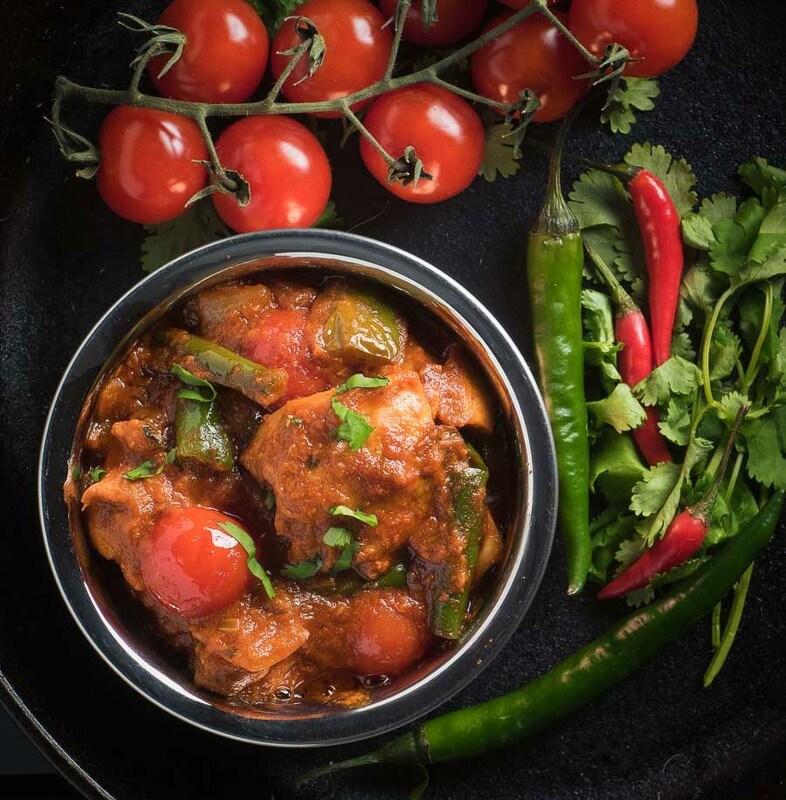 It's key to the taste of a jalfrezi. Add the garlic ginger paste and cilantro stems and cook until the garlic ginger paste stops spluttering. Turn the heat to medium low. Add the spice mix and stir continuously until it starts to smell really good - around 30-40 seconds. Watch it carefully. If you burn the spices at this point you have to start over. It will stick a bit. That's OK - you will deglaze with the tomato mixture. Add the diluted tomato paste and stir to combine. Turn the heat up to medium. Cook for 1 minute, scraping up any spice mix that stuck to the pan..
Add the onion paste and turn the heat up to medium high. Cook, stirring occasionally for about 4 minutes. It will darken a bit as it cooks. Don't worry if it seems a bit dry. The chicken will release juices as it cooks and you should be left with a nice amount of sauce. If the curry is a bit thick add a bit of water or chicken stock and stir. Add the cherry tomatoes. Let the chicken jalfrezi simmer another minute or so. Taste for salt and adjust as needed. It may be a bit under salted at this point. Garnish with a bit of cilantro if desired. The recipe for Indian restaurant spice mix can be found here. You can buy garlic ginger paste but it's easy to make and homemade is way better. Here's an easy recipe for garlic ginger paste. If you cook Indian fairly often it's so worth it to whip up a batch. It will keep for a few weeks in the fridge. In indian, main course. Bookmark the permalink. I’ve got to say that one of the best jalfrezi I’ve made for a long time. It had the right balance of spice and heat , loved the home made spice mix. The only thing I did different was flash fried the onion and pepper then added them back at the end of cooking, I love the rawness of peppers.